Only in Ogden Store and Gallery 2246 Washington Blvd. 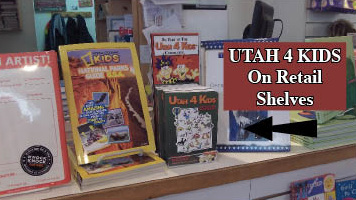 Utah.com Check out the amazing info they have on this site and you can also buy the Utah 4 Kids book there. We are here to help kids engage in more creative fun across Utah and we want you and your organization to be part of that. We look forward to connecting with you and being a part of this amazing journey. See contact tab at the top of this page for all our contact information.